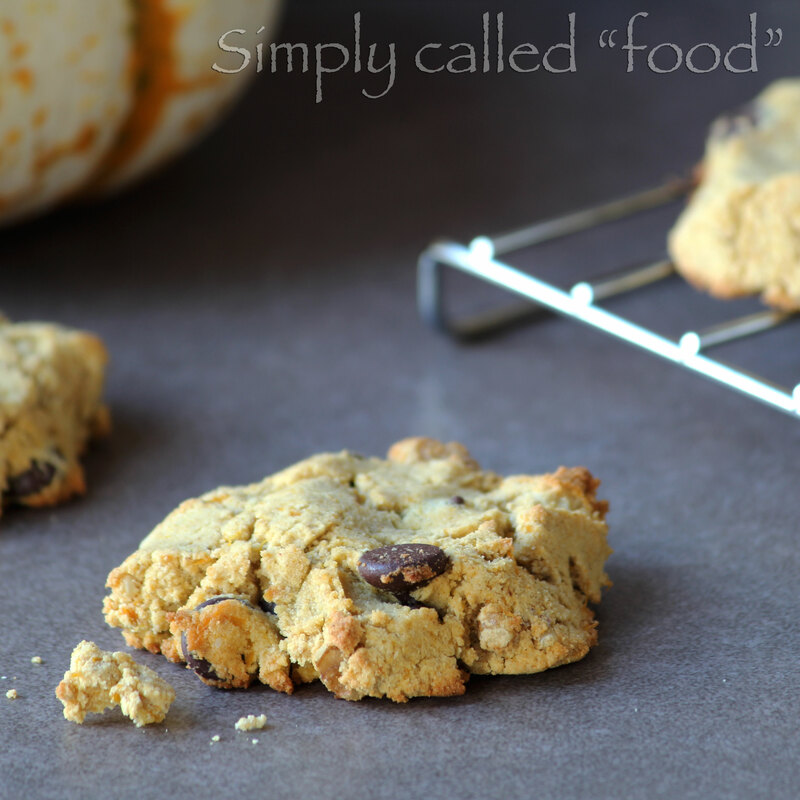 Gluten free pumpkin cookies | Simply called "Food"
Another great recipe to make with a pumpkin is cookies. The thing when you cook your own, is that you will get the taste you want from it because you control the cooking. It’s also a nice cookie recipe to put on your Thanksgiving table or you can even bring it as a gift to someone who’s gluten intolerant. There are things you have to verify though when you cook for others. Make sure your tools are really well washed and that there are no cross contamination with wheat flour or products that contain gluten. Use certified gluten-free ingredients. Even spices may contain gluten, so double check. There is one thing for sure, it’s that the person who will receive this gift will really appreciate it. In a medium bowl combine the all-purpose flour, the sorghum flour, the coconut flour, the baking soda, the baking powder, the cinnamon and the salt. In a bigger bowl, mix the butter, the mashed pumpkin, the maple syrup, the almond milk and the vanilla until it’s all well blended. Add in the flours and continue mixing. Stir in the chocolate chips and the walnuts. Place the batter on a cookie sheet. Place it in the oven for 15 to 18 minutes or until golden, depending on your oven. When they’re cooked, place your cookies on a wired rack to cool down. 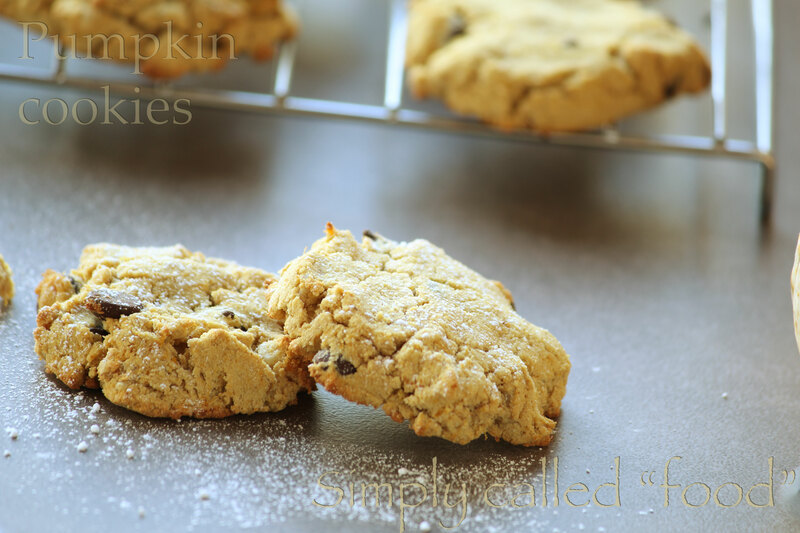 Tags: Chocolate chip, coconut flour, Cookie, dessert, Food, Fruit and Vegetable, Gluten free, Maple syrup, Nuts, Pumpkin, Recipe, Sorghum flour, Thanksgiving, Vegan, Vegetarian, Walnut. Bookmark the permalink. I am obsessed with all things pumpkin right now. Can’t get enough of it! I know me too! And I just prepared a soup tonight, you will be able to see it this week! It’s a scoop! 🙂 Have a nice evening! Where do you get your sorghum flour? I can’t always find it in my stores and when i do it is quite pricey per pound. Love what you did with the cookies though and can understand why they disappear. I got it at my natural food store. It is a bit pricey but I combine it with other flours. Have you compared with Amazon.com? Sometimes they have good prices. Thanks for your comment! unreal!!! Definatly have to try this! Thanks for the reblog! Have a nice day! I’m definitely enjoying your blog aand look forward to new posts. Yes I’m on Twitter, the link is https://twitter.com/Simplycalledfoo Thanks a lot and have a nice day!